A growing body of evidence indicates that the trillions of microbes that live on and inside our bodies—what’s called our "microbiome"—affect our health. Recent research, for example, has found that changes in the composition of bacterial communities in our intestines lead to imbalances in metabolic processes the microbiome collectively perform, and that such imbalances are associated with obesity, type 2 diabetes, cancer, autoimmune diseases, and certain neurological disorders. 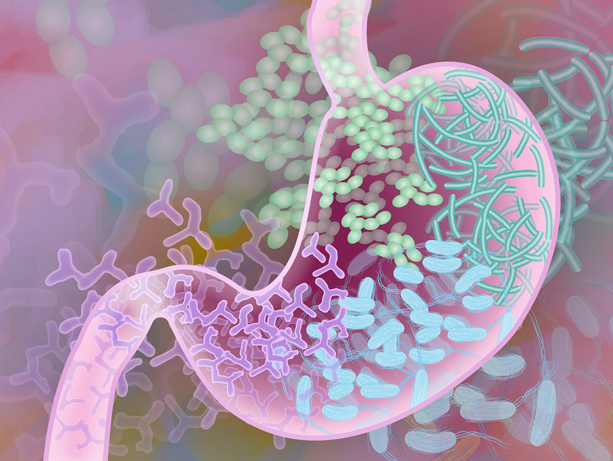 These findings suggest that it might be possible to prevent or treat these conditions with diet, drugs or some other intervention that restores the microbiome's functional capacity. To do this, though, it is first necessary to determine which bacteria are responsible for which functional imbalances. Elhanan Borenstein was senior author of the microbiome study. This is no small task: Hundreds to thousands of bacterial species populate different microbiomes in a human body. In a new paper appearing in the journal Cell Host & Microbe, researchers at the University of Washington School of Medicine report that they have developed a novel method that reveals how much individual bacterial species contribute to disease-associated functional imbalances in the microbiome. “This method opens the way to pinpoint which species in our microbiome are responsible for each functional imbalance, so they can be targeted for therapy,” said Elhanan Borenstein, the paper's senior author and an associate professor of genome sciences. Borenstein’s lab studies the human microbiome and develops computational methods to model, analyze, and integrate microbiome data. He co-wrote the paper with Ohad Manor, a former postdoctoral fellow in his lab who spearheaded the development of this method. The “Functional Shifts’ Taxonomic Contributors” method, nicknamed "FishTaco," integrates two common ways scientists look for associations between microbiomes and disease: a taxonomic approach and a functional approach. Briefly, the taxonomic approach looks at which species, or taxa, of microbes compose the microbiome. The functional approach, in contrast, examines all the genes present in a microbiome. Since genes code for the proteins that determine the microbiome’s activity, the total gene content of the microbiome tells you what functions its microbial population is capable of performing. Essentially, the taxonomic approach focuses on who is there and the functional approach is on what they are doing. Each of these approaches, however, tells only part of the story, and it was unclear how to combine the two. “FishTaco integrates the taxonomic and functional approaches, linking shifts in the microbiome’s species and gene compositions and identifying the taxa that drive functional imbalances observed in different diseases,” Borenstein explained. In their study, the investigators used FishTaco to analyze the microbiomes of individuals with type 2 diabetes and inflammatory bowel disease, identifying the taxa contributing to functional imbalances in these diseases. They found that functional shifts are often driven by diverse combinations of species. Surprisingly, they further found that very similar functional imbalances observed in different diseases may in fact be driven by completely different set of species.